Follow President Martin on Twitter @SPUPres. The name of Seattle Pacific University’s magazine, Response, has never seemed more appropriate to me. 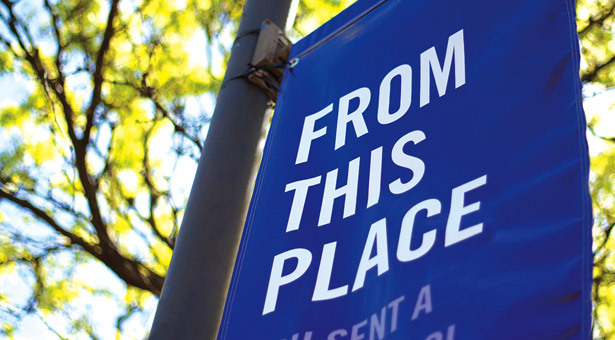 Alumni and friends of Seattle Pacific know that the University’s history is replete with examples of people “responding.” In fact, you could say that responding — to the call of God and to the needs of the world — is in our institutional DNA. Seattle Pacific was founded in 1891 when three individuals, Bishop B.T. Roberts, Nils Peterson, and Hiram Pease, acted on God’s prompting and led the establishment of a Christian school in the Pacific Northwest with the purpose of educating students for lives of service. Alexander and Adelaide Beers responded to the call to serve as the first president and faculty members — and the new school opened its doors. From those very first days, SPU has been active in the city and the world, working to better understand people’s physical, emotional, and spiritual needs, and responding with outstanding academic programs that equip students to be graduates of competence and character. For more than a century, Seattle Pacific alumni have gone out to live and serve in all corners of the world, seeking to show the love of Christ to their neighbors. The SPU story has always been one of response. In recent weeks, however, the word “response” has taken on new meaning for me. Seattle Pacific has benefited from the response of many people in our city and around the world to the senseless act of violence our community endured on June 5. We are grateful beyond words for the first responders — SPU’s Safety and Security staff, Seattle Police officers, Seattle firefighters, and others — who risked their own lives for the safety of our students, faculty, and staff, and whose quick actions prevented further harm and loss to our community. We are also thankful for the extraordinary medical response in this city, including the staff of Medic One and Harborview Medical Center. And we gained great strength from the supportive response of alumni, parents, friends, schools, churches, community organizations, and so many others. I’ve come to believe that the true character of Seattle Pacific University was revealed in how we responded to this event. If anyone ever wondered about the nature of SPU, about our DNA — it was fully exposed for the world to see. Professor Rick Steele described this moment as “our darkest day and our finest hour.” To me, he meant that the Seattle Pacific community responded to tragedy by doing what came naturally. We gathered together, cried together, prayed together, cared for one another, and trusted God. Students organized themselves into prayer and support groups, held candlelight vigils, and ministered to the needs of their classmates. Looking back, I believe they were beacons of God’s love to people on and off campus. I have never been more grateful to be part of this university, this very special community. Certainly, we are far from perfect, and called daily to more closely follow the example of Jesus Christ. But this is a place where we strive to live what we believe, a place where our Christian identity is foundational and formative. This is a place that represents the very best of what it means to be an academic community of faith, striving to be graceful and hospitable in all circumstances, to be encouraging and comforting to those who are hurting. At SPU, I see strong, resilient, and hopeful people who believe we can rise above pain, enabled by a life in Christ and the power of the Holy Spirit. I see people who understand that who we are is more clearly defined by our response to the events we encounter than by the events themselves. And perhaps the greatest definition of “response” in SPU’s history can be seen in the everyday response to life of our students and alumni. I continue to hear accounts of how our students rise to a professor’s challenge to learn, of how they overcome seemingly insurmountable obstacles to complete their SPU education. I hear of alumni living with integrity as single parents, facing with courage the realities of illness or unemployment, and serving with faith and optimism their churches and communities. Ultimately, it is my dream to see our students and alumni authentically respond to SPU’s vision for “engaging the culture and changing the world” — seeking the kind of change in our world that brings healing, human wholeness, and harmony. I pray that each one of us will consider our response to what we encounter every day — good or bad — because the seemingly most insignificant response can make a profound difference. Dan Martin is SPU’s 10th president. You can follow him on Twitter @SPUPres.